I was highly honored to give this talk on Friday, September 7, at the Hall of the Labour Buozzi of Brescia, in northern Italy. 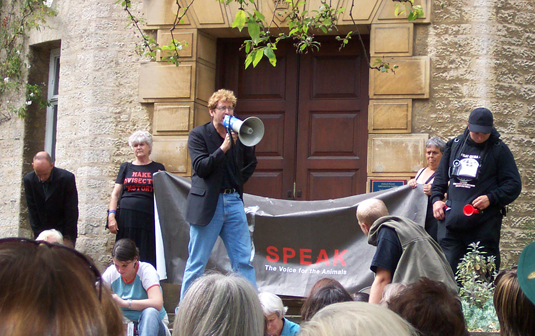 This talk, entitled “Fighting the Global Vivisection-Industrial Complex Through Militant Direct Action,” was organized by the Occupy Green Hill Movement, which led the amazing daylight open rescue of hundreds of puppies targeted for vivisection and certain death at the Green Hill compound, just a short drive from Brescia. 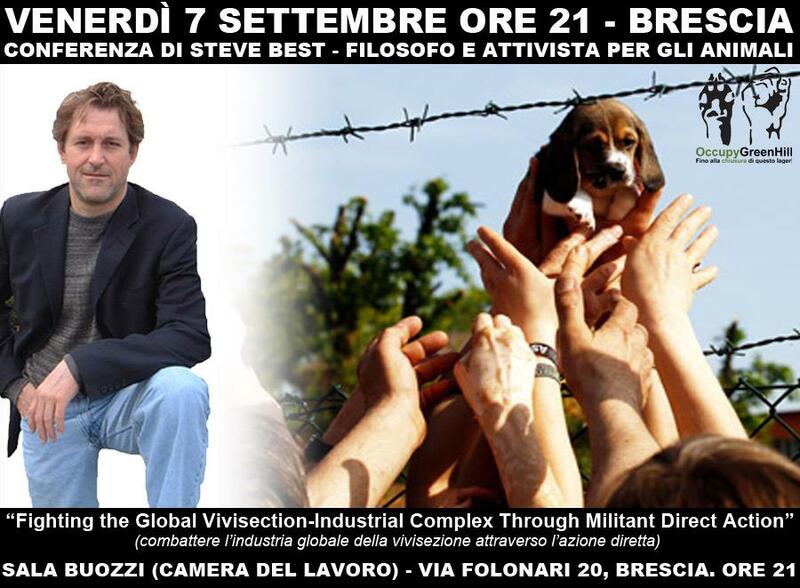 This was the first conference since the bold beagle liberations, and I expect Italy to catch fire and become a flashpoint of animal liberation in the coming years. was organized by The conference was introduced with an update on the current situation of Green Hill, the current trial process, and a brief overview of how the struggle movements evolved and culminated in stunning success that typically only militant direct action can bring. I then followed with this sharp critique of the global vivisection industrial complex and a call to escalate direct action liberations throughout Italy. 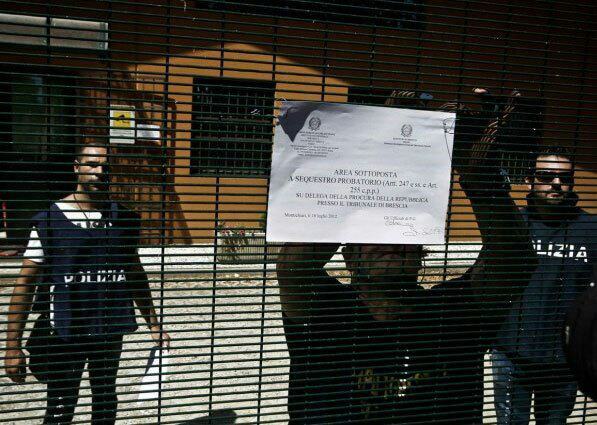 Italian Police Seize Green Hill Lab! 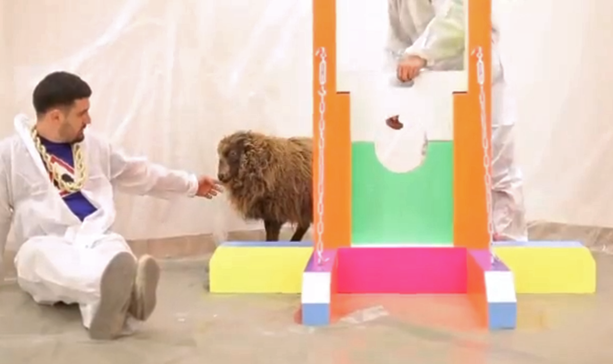 This is a rare and decisive victory! It will be sealed if and when this investigation is over, all remained dogs are rehomed, and Green Hill Lab is as dead as the legitimations for vivisection. Congratulations GH activists, all of Italy, all anti-vivisection abolitionists, to all the animals saved and to be saved!!! Let us savor this moment and grow stronger! 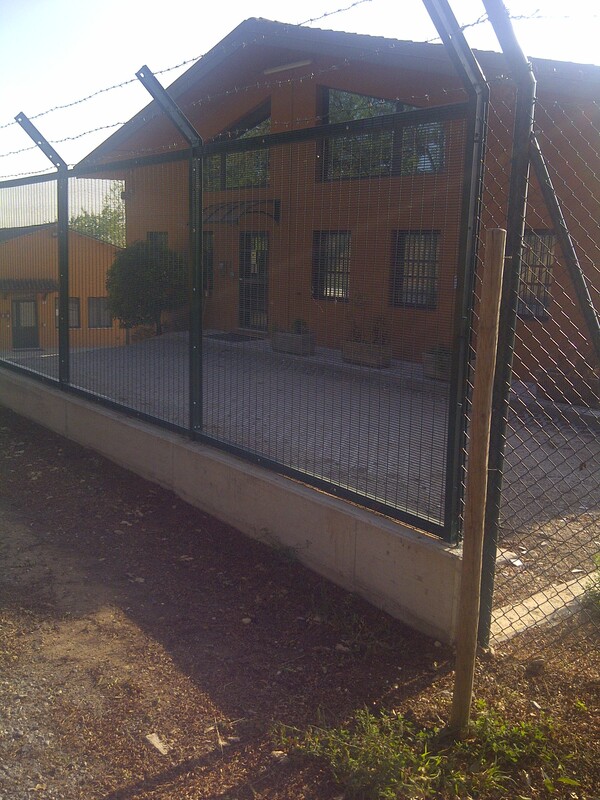 IMPORTANT ACTION: GREENHILL DOGS STILL TO BE RELEASED; HELP ENSURE THE JOB IS DONE. 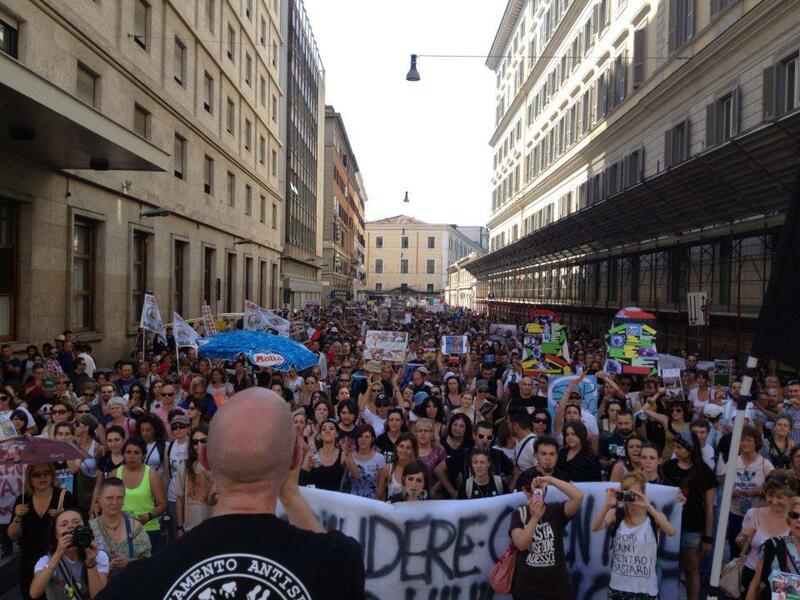 Activists around the world need to look to Italian activists as on June 16, 2012, they converged en masse, refused to beg for crumbs, and came together 10,000 strong to demand Animal Liberation. 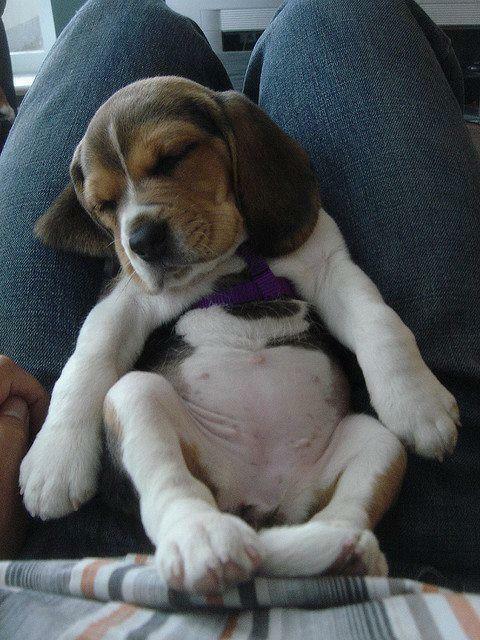 In April 2012, Italian activists liberated beagles from Greenhill in a daring action during their last rally. 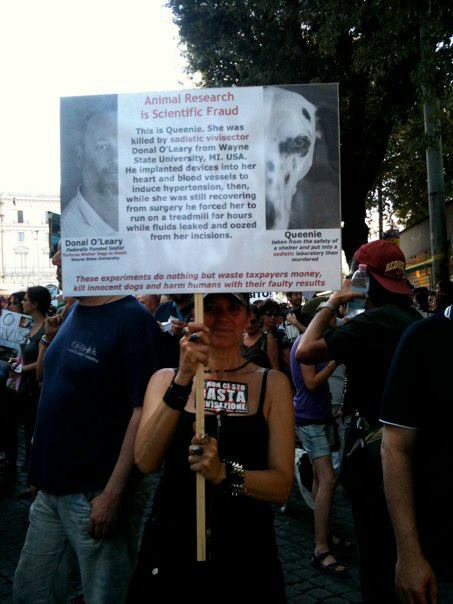 And yesterday, housands of activists swarmed the streets of Rome determined to end vivisection in their country. This demonstration was the largest one yet according to campaign organizers. And in an escalation of tactics, on June 30, activists will set up camp outside Greenhill for two weeks. 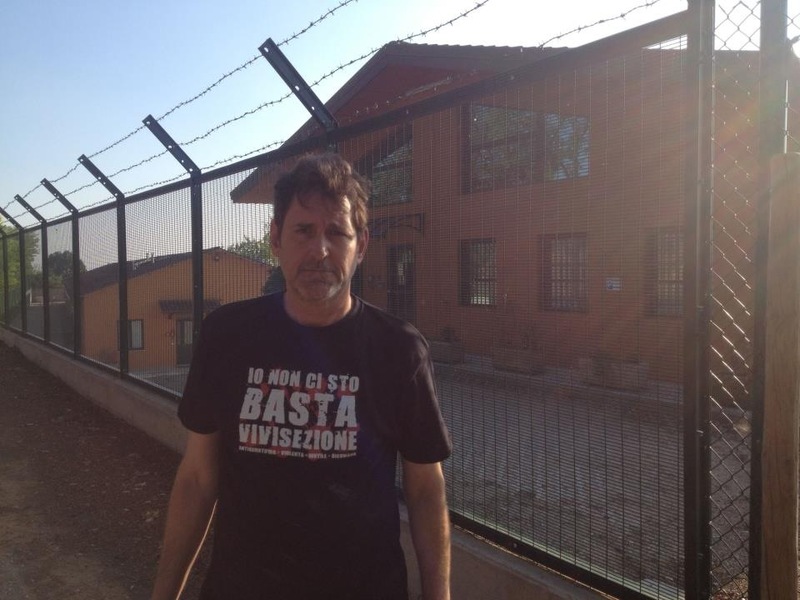 Italian activists also took this opportunity show solidarity with NIO and shed global exposure on Wayne State’s dog-torturing degenerate, Donal O’Leary who is no the official global poster boy for vivisecting sadists. 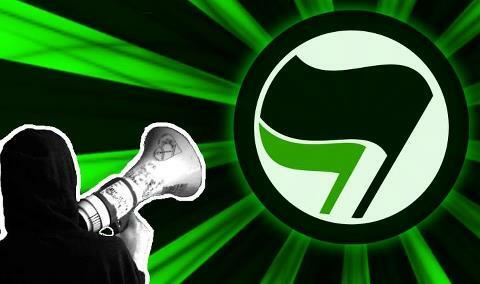 It is time for American activists to model our actions after the Italians. 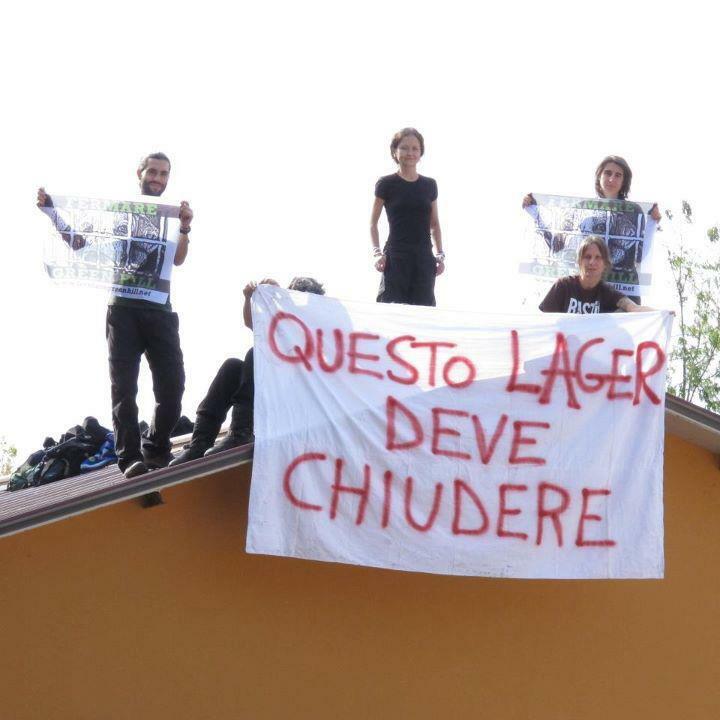 On October 14, 2011, Italian activists occupied the roof of the beagle delivery unit at Green Hill (Marshall BioResources), Europe’s largest farm breeding dogs for vivisection. Currently in the UK, the farm’s sister company – B&K Universal – are attempting to gain permission to construct a facility holding 2,000 beagles for laboratories. 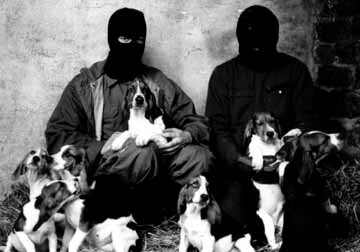 On April 28, animal liberationists launched a bold raid which, despite losses noted below, was a clear victory and set a new precendent Italian activism and, along with the amazing Chinese activists who have stopped trucks carryinmg hundreds of dogs to the slaughouse, let us hope the global animal liberation movement is turning a corner away from pacifism — technically, passivist non-resistance and collaborationism — toward militant direct action and animal liberation by any means necessary. 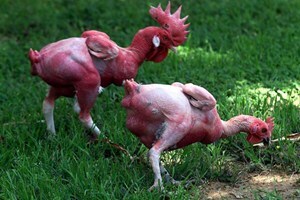 Cops arrest 12 activists, 7 still held, servants of the state and ultimate slaves to capital, cops return 7 of 30 liberated dogs to their tormentors in white suits; all animals freed from the budgeons of the phamaceutical-industrial complex noted to have strong smell of urine and one puppy bore the scar of an incision running the length of his abdomen (see the Examiner story). 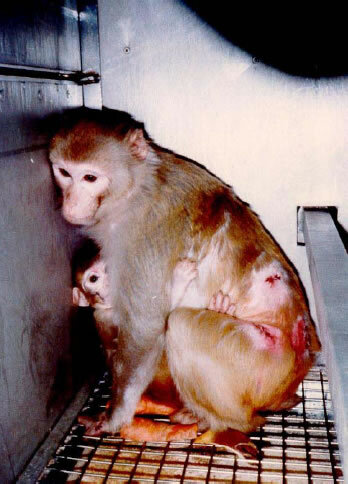 2) Sign a petition demanding the release of human and nonhuman prisoners held at/by Green Hill Labs and the Italian state. THE DOGS WERE NO ONE’S TO “OWN” IN THE FIRST PLACE, LET ALONE TO MAIN, POISON, TORTURE, AND MURDER; HUNDREDS PERHAPS THOUSANDS OF ITALIAN FAMILIES ARE NO DOUBT OFFERING LOVING CARE AND HOMES FOR THESE VICTIMS OF CAPITALISM AND PSEUDO-SCIENCE. 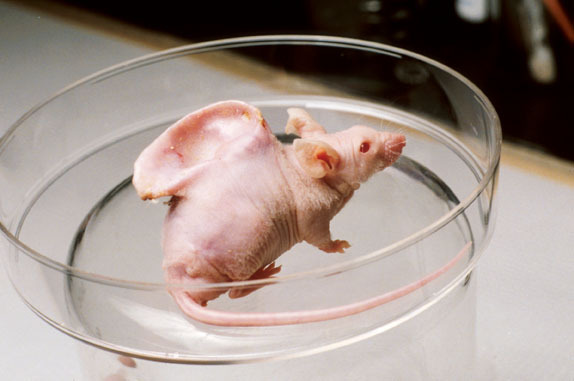 THIS IS THE 21ST CENTURY, VIVISECTION IS ROOTED IN AN OUITMODED 17TH CENTURY PARADIGM. 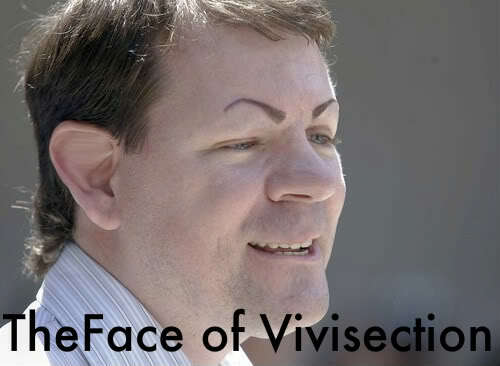 SMASH THE GLOBAL VIVISECTION-INDUSTRIAL COMPLEX! 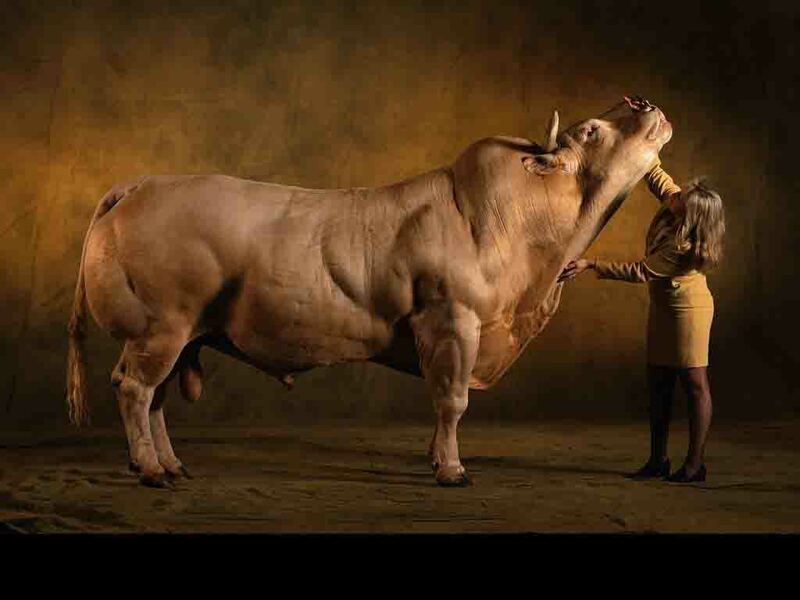 MORAL AND SCIENTIFIC PROGRESS ARE INSEPERABLE FROM ANIMAL LIBERATION! This beagle is safe tonight and will likely never agained he hated and tortured, only loved and comforted.